The Dumb of All Fears. Not since Marky Mark replaced Charlton Heston in Tim Burton’s remarkable film about ape-poo, has there been such an inadequate, impotent re-imagining of a well-known filmic character. In THE SUM OF ALL FEARS, Jack Ryan, CIA gadfly, has morphed from Alec Baldwin’s Runway-Model Ryan (equivalent to Roger Moore’s Bond), to Harrison Ford’s Real Man Ryan (a presence to be reckoned with – definitely the Shatner of the set), arriving at the Girl-Child Ryan of Ben Affleck, who tries to shoulder a character which he has not the imagination, let alone the acting prowess, to flesh out, trying to command respect by keeping his hairstyle trendy. Plot is predicated on the callousness which pervades all levels of U.S. Government, the field of nuclear weapons being no exception. This attitude – more than any plot contrivance of “losing” a nuke in desert sands, only to have it found by a mercenary and sold to the highest oily-complected bidder – should be the actual cause for alarm in America. Lusterless institutions such as the U.S. Postal Service merely underscore the reality of that attitude’s pervasiveness. 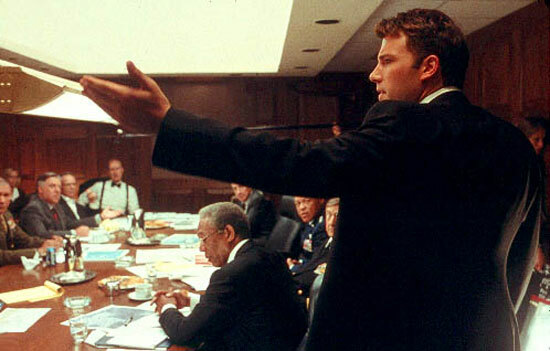 But would anyone feel an inkling of reassurance in the case of a nuclear strike with Affleck’s dandelion Ryan swishing about yapping counterstrike measures in that girl-scout alto squeal? As in Marky Mark’s PLANET OF THE APES, we have the unpopular guy at school being made classroom monitor and having shoes thrown at him when he asks for quiet. Liev Schreiber sneaks about as one of them infallible “covert” guys, James Cromwell is The President (and let’s face it – visually, he’s all over it like stank on backwater Louisiana Blues), and Morgan Freeman is, as per his idiom, one of those know-it-all presidential aides who speaks to everyone with an authority that makes you wonder whether he has taken orders from anyone in his life, ever. Though Harrison Ford had a full-fledged family in his Ryan movies (PATRIOT GAMES, 1992, CLEAR AND PRESENT DANGER, 1994), in SUM, Affleck is yet child-less and free to engage in “steamy” embraces with his plain girlfriend (Bridget Moynahan) to disprove the theory that he really is Jennifer Lopez’s lesbian love-interest – but there’s more heat in the iceberg that rammed the Titanic. I’m still trying to figure, with Ryan being such a young-un, whether these events took place before or after the first attack on the Death Star? During the nominally more interesting second half of the film (mainly because there’s more running and – surprise – a nuke is actually detonated! ), Ryan composes many exciting Instant Messages while stealing a truck, and shouts into a cellphone a lot, trying desperately to grow into the mantle of action hero which has been thrust upon him. And makes James Cromwell look like Arnold Schwarzenegger in the process. Ultimately, we are being made privy (albeit by Hollywood standards) to this insular world which we hardly care about anyway: political “leaders” all making threats, weaponry, war-gamery for their own agendas, caring nothing, doing nothing for the rest of us in the trenches, only involving us when things blow up and it’s reported by CNN. To make a movie about nuclear threat even remotely interesting these days…. don’t make it. It’s boring. It’s pointless. It’s not even original – yet another re-telling of MACBETH (do unto your neighbor before he does unto you). 27,000 nuclear weapons. One is missing. Who cares? The Sum Of All Fears: that Ben Affleck will be the next James Bond. Writers: Tom Clancy, Paul Attanasio, Daniel Pyne. 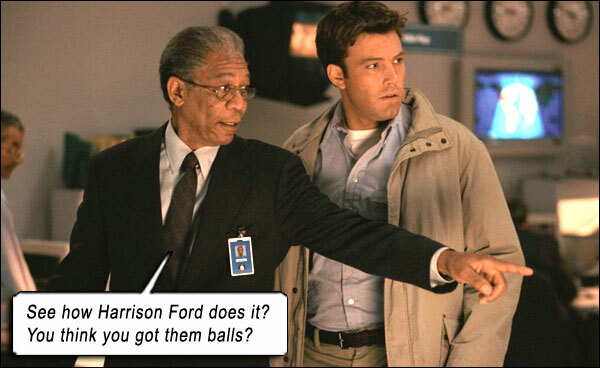 Starring: Morgan Freeman, Ben Affleck, James Cromwell, Liev Schreiber, Bridget Moynahan.